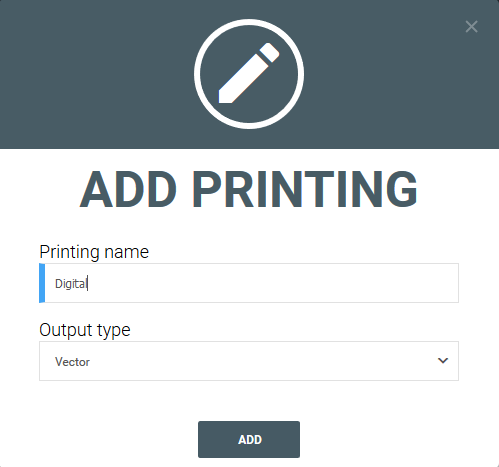 The Printing methods section has all printing methods which you set during the addition of printing methods for a product into configuration phase. 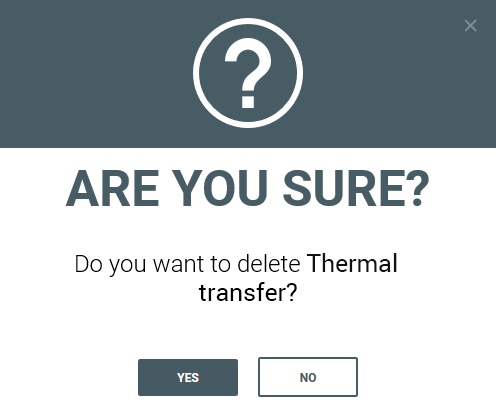 You can naturally manage them here, adding new printing methods or deleting those already set. The addition of a new method happens when you click on Add printing button at the top right of the section. Into the window that appears insert the name of new printing method and the type of output to create, then click on Add . 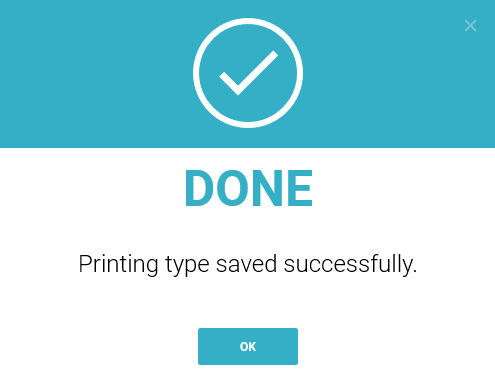 You'll be notified on saving completion of the printing method with a pop window. If you click on the pencil icon, you will be able to edit a previously created printing method. Also, if you have activated the "CMYK" add-on, here you could upload your own CMYK .icc color profile. This profile will be used to convert the output PDF files so they are print ready. Please note that you can't upload RGB or sRGB color profiles, but only CMYK, and that converted PDF colors couldn't be 100% accurate because of the conversion algorithm complexity. The elimination of a printing method happens when you click on bin present at the bottom right side of each method on the list. The elimination of a printing method from the list is an irreversible process and it can't be undone. Besides, if the selected method is already in use for at least one product, the elimination is forbidden.